An 8 million Euros grant was attributed by the EU to the ShikiFactory100 project, an international effort coordinated by biotech SME SilicoLife, in cooperation with some of the most relevant players in Europe, covering leading research institutions, SMEs and a large industrial company. The ShikiFactory100 project aims towards the production of a universe of more than 100 high-value compounds from the shikimate pathway, a hub in cell metabolism, through the development of an optimized chassis and the proposal and implementation of novel biosynthetic routes for the production of known and new to nature molecules. The ShikiFactory100 Horizon2020 project gathers 11 partners from 7 countries, SilicoLife (Portugal), Technical University of Denmark, European Molecular Biology Laboratory (Germany), École Polytechnique Fédérale de Lausanne (Switzerland), NOVA University of Lisbon (Portugal), University of Manchester (UK), University of Minho (Portugal), c-LEcta (Germany), GalChimia (Spain), NNFCC (UK), and DSM (the Netherlands). “SHIKIFACTORY100 offers enormous potential for the EU competitiveness for the biotechnology. The scale and integration of state-of-the-art technologies proposed are unprecedented in Europe contributing to increasing the European leadership in synthetic biology, hopefully setting a new EU-wide trend in motion and increasing the competitiveness of our bioeconomy” says Simão Soares from SilicoLife, the Coordinator of the project. The development of economically feasible and sustainable biotechnological processes as alternatives to oil-based chemistry is one of the major goals of the bio-based economy. The global chemical industry has initiated a crucial transition from petrochemical processes to bio-based chemical processes. Synthetic biology and bio-based processes are expected to become the preferred approach to produce chemicals from renewable feedstocks using cell factories. “Synthetic Biology has the potential to transform a range of economic sectors based on the availability of cost-competitive cell factories for the production of chemicals. The success of this strategy will require efficient, robust and versatile cell factories but the improvement of currently used strains towards such platforms is hindered by the limitations of conventional methods for strain improvement. In this project we aim at greatly accelerating microbial cell factory construction by developing and combining novel computational, in vitro and in vivo methods” says Isabel Rocha from NOVA University of Lisbon, Scientific and Technical Manager of the Shikifactory100 project. The project will develop and consolidate an integrated Synthetic Biology platform for engineering tailored strains, based on simplified and optimized genomes for the efficient, cost-effective bio-based production of chemicals around the shikimate hub. The ShikiFactory100 (Modular cell factories for the production of 100 compounds from the shikimate pathway) grant was given as part of a call from EU within the Horizon2020 program “Synthetic biology to expand diversity of nature's chemical production”. 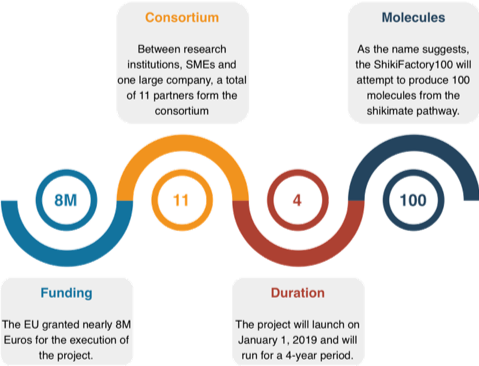 The research partners will develop novel methods for pathway discovery and compound design, collaborating with the companies in the rapid prototyping of genetic pathway designs, implementation and optimization of the chassis, while the SMEs and the industrial partner will lead the assessment of the products and the exploitation of the results for different application areas. This project has received funding from the European Union’s Horizon 2020 research and innovation programme under grant agreement number 814408.